And so we pick up where last week’s episode left us anxiously awaiting the continuation of the fight against Pride. Now with the ability to smell his prey, having eaten Gluttony and stolen his Philosopher’s Stone, the homunculus determines that Hoenheim is nearby; that if he captures Ed, Hoenheim will have no other choice but to reveal himself. In order to lure him out, Pride attacks Ed, Greed and Lan Fan, who experiences a moment of weakness when the effort of their fight finally takes its toll. She manages to nearly escape being eaten when Ed comes to the rescue, much to her dismay. Ed reminds her that it is too soon to be fighting as she has only had her automail for half a year. It took Ed a year to fully recover from his, and even then such a thing was unheard of for a kid his age. 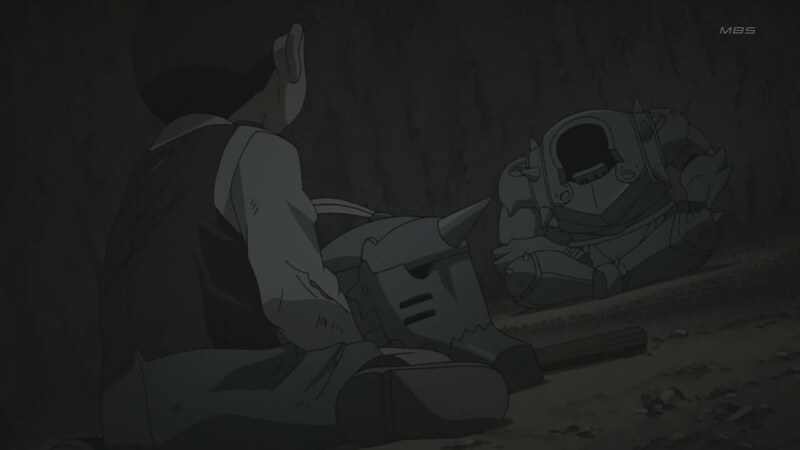 Meanwhile, there is a moment of nothing but darkness and beams of light race passed the screen as Alphonse finally wakes from his bout of ‘sleep’. Hoenheim is there. Darius, Fu, and Heinkel eventually show up, but the chimera is in desperate need of medical attention. As Fu describes the situation, Al is formulating a plan of attack. He seems to blame himself for being caught by Pride and acting as the homunculus’ shell. They are running out of time. If they do not act fast, the people of the village will be dragged in as well. Because of this, Al asks his father to lend him his alchemist abilities. Back in the clearing, both Ed and Greed are pretty much getting their asses whooped; not even Lan Fan is safe hiding off on the sidelines. After a bit of smothering this temporary victory in their faces, Pride senses that Hoenheim is much closer now and the man shows up, walking casually out of the forest with his hands in his pockets. Gotta wonder why he didn’t just show up earlier and take care of the situation right then and there. Regardless, he has not come empty handed. The moment Pride attempts to attack, Al runs up from behind only to be caught once again. There is a brief moment where it seems that Al’s plan has gone sour, but Pride is the one who has been tricked. We bear witness again to Hoenheim’s power as he creates a dome-like structure encasing the homunculus inside along with Alphonse. Ed, naturally, blows up in anger, assuming Hoenheim is to blame but his father explains that it was Al’s idea. Al apologizes to his brother as they had only been reunited for a short time before having to sacrifice himself once again. The good thing, however, is that he will only have to remain inside the dome for a day – The Promised Day. Now with Pride temporarily disabled, Greed decides to take action on his plan to rule the world and heads for Central. 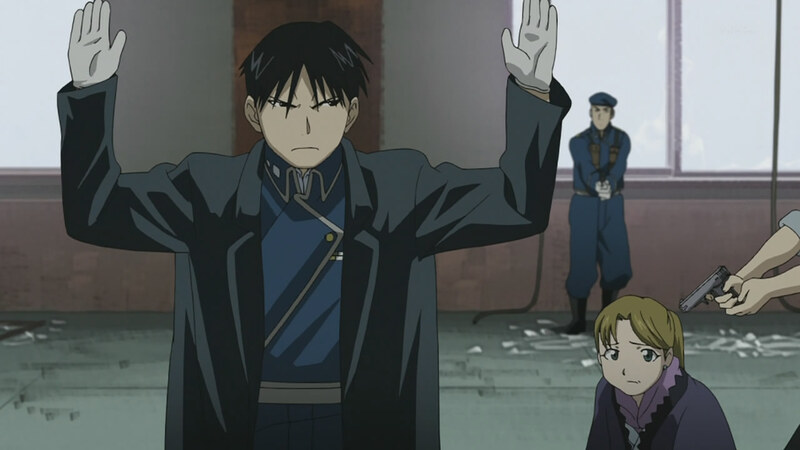 He knows that the only homunculi left are Father and Sloth. Somewhere off in the city, a couple of transient-looking fellows are gossiping about the presence of a good number of Ishbalans in Central lately. Much to their surprise, having mentioned him just moments before, Scar and his group appear. They learn that May-chan is still in the area even though they had sent her off with Envy back to the Kingdom of Xing. They also learn of the explosion that sent Bradley’s train plummeting into the river. The eerie music that follows is a perfect segue into reintroducing a character we haven’t seen for a while: Kimblee! Apparently, he has been up to no good, having killed off a group of Ishbalans. Back in the forest, Al and Pride have a chance to really discuss things now that the Homunculus cannot use his power. Pride reflects on how most people tend to care about themselves and no one else. He mentions, using Mrs. Bradley as an example, that there are humans who would sacrifice their lives in order to save something precious to them. He finds her fascinating as he has never had a mother before. He admits that living with her was ‘fun’ and that he does love her. All the while, banging on Al’s head, which is a rather significant piece of information. The episode wraps up with Mustang paying a visit to Hughes’ grave one last time before embarking on their journey. In the forest, Scar and Marcoh’s group have arrived to find the huge mound and to reunite with everyone else. Some discussion takes place. 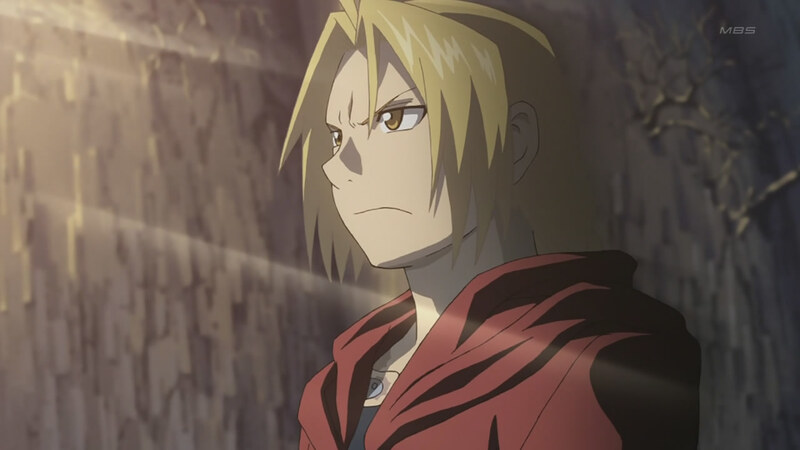 Fu has decided to head into Central to do a little investigating and to keep an eye on Greedling. After the credits roll, back in Central, we are taken to Brosh’s place where his brother and sister have spotted some smoke billowing from the city. He informs the kids to stay inside and rushes off. Mustang is the one behind it and has been spotted by the military. In a building, the soldiers manage to catch up with them, ordering to kill everyone but Mustang, much to Mrs. Bradley’s dismay; not that I blame the poor thing. Her country’s toughest and most loyal individuals have now completely turned against her. A shot is fired, but the camera quickly pans away, leaving us to wait for yet another installment! This episode, while a little slow in the beginning as the fight comes to an end, picks up near the middle when Kimblee reappears. After plotting for quite some time, Mustang and his team will finally get a chance to be in the spotlight, along with Kimblee and Scar’s group. Discuss the episode here on the forums!